Several interruptions, one broken needle, and thirty minutes of hair-pulling later trying to trouble shoot the fancy electronics on the Bernina and the swing cover is finally done. Working without a pattern was challenging, but I enjoyed myself. Alternating between sewing machine and garden, I worked my way through trial fittings as I went along. I made bias tape for the piping, trim and ties using a continuous bias technique I’ve not used in years. Thank you Google search and my fellow bloggers for the tutorials. The swing cover slips on and off in less than two minutes, so it will be a breeze to remove it for cleaning. We celebrate Mike’s 50th tomorrow with a small gathering of friends (in the back yard of course). Do you think it would be unseemly for me to take a nap mid-party? Make it Modern: How to sew continuous bias or binding. 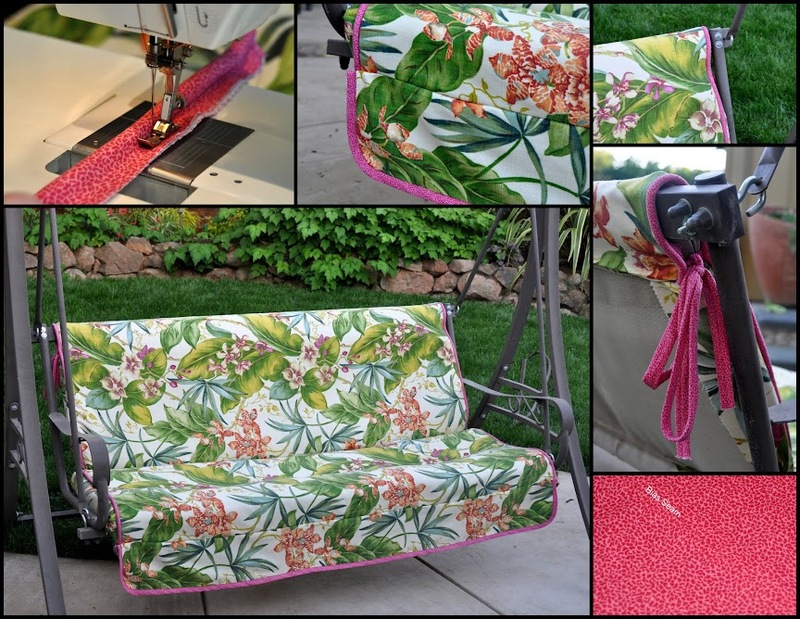 This entry was posted in Gardening and tagged garden, garden party, garden swing, Home and Garden, Sewing, sewing a slipcover. Bookmark the permalink. nice, does it have the shade part over it and if so did you recover that too? I have that swing and it’s all moldy because we live in Humboldt County! Bonnie, how funny that you have the same swing. Mine was a Mother’s Day present a few years ago. It gets hit by the sprinklers so that doesn’t help. The entire swing got tossed into the shrubs in a wind storm, damaging the threading for the canopy. Mike thinks he can repair it. If he can, then I’ll sew a new canopy as well, probably out of a solid green fabric. Do you still sew? I realize how much I miss it. yes, I just made my granddaughter a dress for her 2nd b-day – I tagged you in the picture so you could see it – you must have missed it. I realized the same thing when I made the dress – how much I missed making things. I have sewn a lot – but mostly bags for Women’s shelters, burp clothes, etc. This am I did make pot holders, oven mitts and an apron for Juliette. I should tackle that ugly swing – you inspire me. 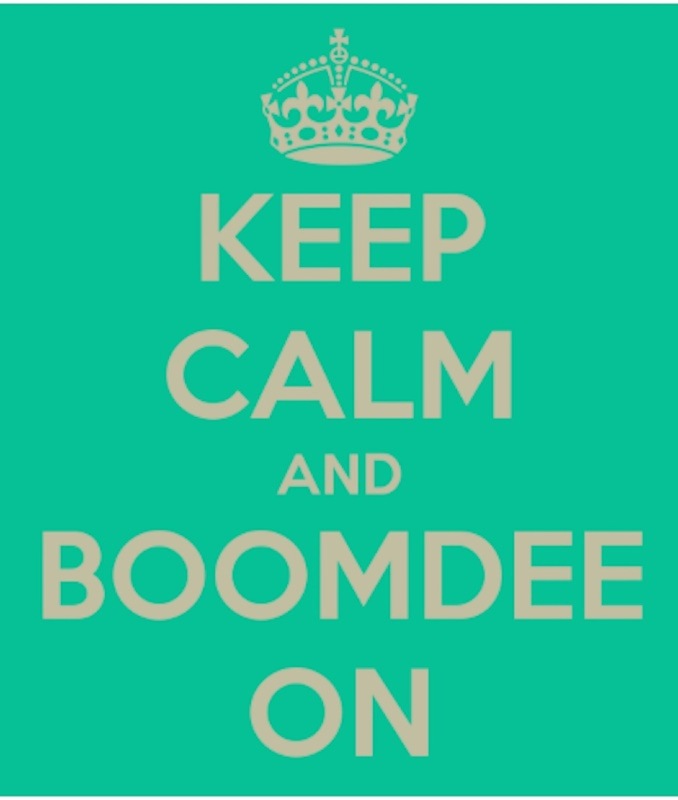 Bonnie, I love that you continue to sew! It’s such a pleasure, and easy to forget that in our busy lives. I plan to do more of it. When Mac was younger, he went through a teddy bear phase and I made three different bears. Just as quickly he was on to something new. I will go look at your page and if I don’t find the dress, I’ll ping you again. Thanks for tagging me…sometimes things on Facebook get missed. Thanks, Sharon! I’m really happy with the way it turned out and even after all the sewing, I still love the fabric. That’s a good sign. Thanks for coming today. I’m glad you got to experience the backyard. I’m really pleased you can easily get back there via the side yard. This is gorgeous! I absolutely LOVE LOVE LOVE the fabric! It’s a print I’d be thrilled to have in my own patio, and is one I’d never tire of looking at. You are truly a marvel! I love the piping/trim. The entire cover looks so well-finished. I don’t sew, myself, and have tremendous admiration for those who do. I really like the before and after photos, as well as the detail close-ups. I wish you and your “sultans” many happy times on your lovely swing! 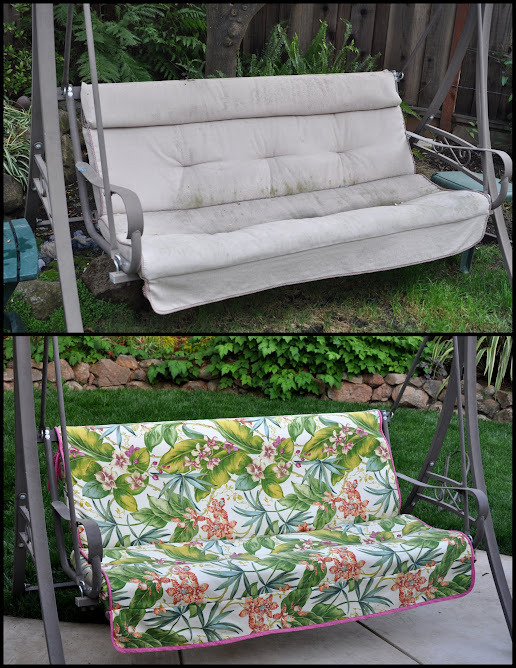 It looks so inviting, and I bet it’s even more comfortable now that it’s received some TLC — and by your own hands. Brava! Enjoy the party! You’ve created a beautiful, welcoming setting for the celebration. Cheers! Thank you for your generous comments! You are so gracious. The fabric is suited for indoors and out, a nice, sturdy yet soft weave by Tommy Bahama. I liked the vintage feel, the colors and the pattern. It was easy to work with as well. I started sewing when I was six, and have enjoyed it my entire life. I made doll’s clothes as a girl, sewed some of my own clothes in high school, and went on to sew and cut theatrical costumes in college and community theaters. I miss it. This was a great project as it was part “build” and part sew. Thanks for your well wishes. I will pass them along to the birthday boy. Is there no end to your talents, Alsy? You are my Goddess of Home! Thank you! I’ve always wanted to be a Goddess! That looks fantastic! You are a makeover artist. It’s a shame YOU didn’t get to have a sleep on it! Enjoy your party, I’m sure you’ll get a lot of compliments. Thank you so much, for your compliment and for commenting. I sat on the swing today and ate my lunch with one of the cats to keep me company. It was a decadent pleasure mid-day, but enjoyable. That swing was calling me!